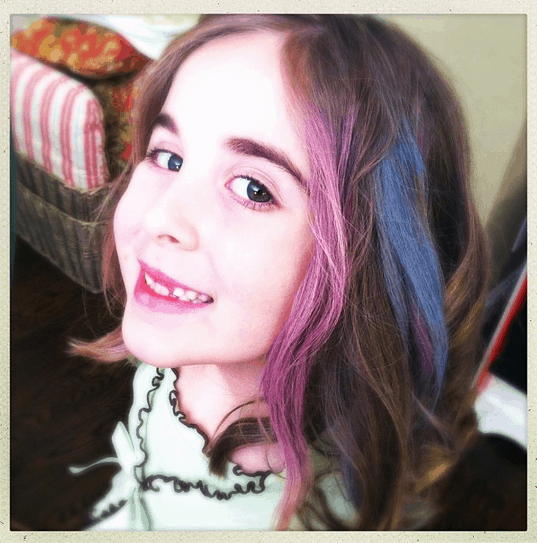 My daughter has been BEGGING me to try out Splat’s new Hair Chalk. I received two different samples and they’ve been sitting in my basement forEVER. We were having a little fun with her hair over the weekend and incorporated the hair chalk into the mix. The application is pretty simple. Spray a section of hair with hairspray. Apply the chalk with your thumb (see video). Set with another spritz of hairspray. I researched online a bit and saw several reviews noting that the chalk got over everyone’s clothing. I have to say this did not happen to us. My advice would be to test it out on your own wearing PJs or clothing you really don’t care about to see for yourself.